Rock out without the wires. The newest generation of bluetooth headphones is getting more and more affordable, but not every device supports A2DP for audio streaming, let alone has bluetooth built in. 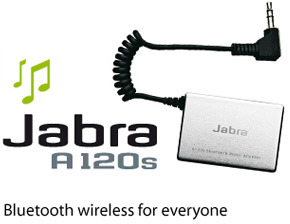 But there’s good news: Jabra’s A120s, a cheap and easy solution to turn any audio device you want (as long as it has ye old standard audio jack) into a bluetooth enabled player. At $29, it sure worth taking a look at if you want to rock out sans wires. It had been a while since I had taken my camera along for the ride to Antwerp. As always, I was just looking around for little details I wanted to catch on “sensor”. My personal favourite of the day is this one of a man who was filming how the subway propelled itself through the tunnel. It made me think about how important multi-media has become in our lives. We listen to music on our iPods or even watch video on them, we take snapshots or shoot some video with cell-phones one couldn’t dream of 10 years ago. Sites like youtube and flickr add a social perspective to this phenomenon. We share what we see, hear and think with the rest of the world through social networking sites and blogs. We ARE the online multi-media generation and an exciting future awaits us. Steve shared some of the numbers about Leopard. In the first 30 months, 20 percent of macs out there has upgraded to or come with Mac OS X Leopard, which is unprecedented in Mac OS X’s short history. Update 1.1.3 (iPhone dev team, GO !) was launched some cool new feaures: sms multiple contacs at once, customize and create up to 9 home screens, maps with location (thanks to google and skyhook technologies) and chapter and language support for video. The iPod touch, from now on, will come with mail, notes, maps, full calendar, etc. The update for existing iPod touch users is $ 20 (not a good move in my opinion). A completely new interface (free update for existing Apple TV owners) and no computer required. Steve also announced the iTunes video rental service (back-catalogue (regular $ 2.99 HD $ 3.99) + new release 30 days after DVD-release (regular $ 3.99 HD $ 4.99)) for which they’ve partnered up with almost all of the mayor studios. The rental service works on a 30 days – 24 hours system. Once you downloaded it, you’ve got 30 days to start watching it and, once you do, 24 hours to finish it you can view it multiple times in those 24 hours if you wish). You can now view pictures straight off of flickr. No more mercury, PVC, flame retardants, etc. A great start to what I think is going to be another exciting year for Apple.